In many cases, the pests that plague our homes actually have an extremely vital role in the ecosystems of the area. One such pest that is beneficial to nature but destructive to homes is the termite. Termites are well-known for their damaging effects on building structures, but they are not always recognized for the importance of their presence in nature. Here at Earthwise Pest Management, we are a trusted Sacramento pest control company, specializing in the eradication of both residential and commercial pests. Not only do we help our clients get rid of unwanted guests in their homes and businesses, but we also provide them with the information they need to understand pests in the local area. 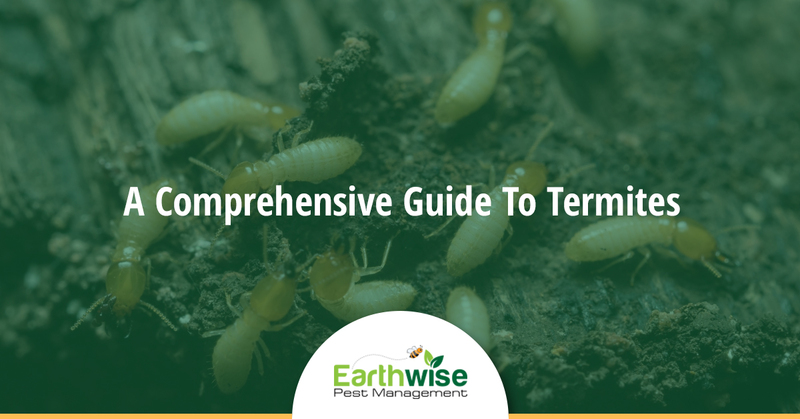 If you are worried about the invasion of termites in your home or business, check out this comprehensive guide to termites. Termites are a type of insect that feeds on the cellulose that is found in wood. There are thousands of species of termites, each playing a vital role in the ecosystems where they reside. While termites can cause structural damage to homes and businesses, their purpose in nature is to break down fallen trees, stumps, and other decaying wood. As they destroy this wood, they return important nutrients back into the surrounding soil. In this way, termites are a useful insect that keeps forests abundant and green. However, when termites turn to our homes and businesses for their next meal, things can become less than pleasant. Unfortunately, termites are not always easy to detect early-on, which means that they can cause severe amounts of damage to structures before they are detected. A professional inspection is one of the only ways to determine whether or not these creatures have chosen your home as their home. Other than the fact that termites enjoy feasting on the cellulose found in wood, it is also interesting to note that termites are a social insect. Just as ants and bees live in colonies, so do termites of all types. This is one reason why an infestation can quickly spiral out of control. Where one termite is found, countless others will be also. In our area, there are three main types of termites — dampwood termites, drywood termites, and subterranean termites. Each termite pest can cause serious damage to your property and can be difficult to eradicate. Drywood termites usually nest above ground and they prefer, as their name implies, dry wood as their food source. Dampwood termites will choose cool, humid locations and nest among moist wood. Subterranean termites are found nesting in soil and build earthen shelter tubes to connect their soil homes with wood. If you believe you have a termite infestation, first make sure you have double-checked to ensure the insect in question is a termite not an ant. A termite has a broader body, without a distinctive and tiny waist. An adult ant with wings will have a tiny waist and their front wings will be larger than their back wings. Conversely, a termite’s wings are uniform in size. You can also take note of the antennae on the insect in question. An ant will have elbowed antennae, whereas a termite will not. Within their colony, termites have a queen termite, who is responsible for laying eggs. A queen termite is accompanied by a male reproductive termite and together, they can reproduce at an astounding rate. A queen termite is capable of laying thousands of eggs in one day. Keeping everything running in the colony are the worker termites who are wingless and incapable of reproducing. Another important member of the colony are the soldier termites with large mandibles. These termites guard the colony and keep it safe from predators. Incredibly, termites often experience an exceptionally long lifespan for insects — queens and male reproductives can live upwards of ten years or more and workers live around two years. If you fear that you have termites living in your home, eating away at the wooden structure that keeps your home secure, it is important to reach out for help from our team. Here at Earthwise Pest Management, we have years of experience working with local home and business owners on eradicating pests. We can help you determine what termites are infesting your property and what the best plan of action will be for your specific needs. We will begin with a formal inspection of your home to determine if termites are indeed your problem and from there we will consult with you about the plan of action to take. Reach out today to learn more about termites from our pest control company in Sacramento. We will be happy to answer any further questions you may have about these invasive insects.